On the occasion of Haus am Waldsee’s re-opening, we will present a comprehensive solo exhibition with Karin Sander. The work of this award-winning artist, who has lived in Berlin and Zurich since 2000 and teaches architecture and art at ETH Zurich, is well-known and exhibited worldwide. Works by Karin Sander are present in numerous international collections and exhibitions. Throughout all phases of her work, Karin Sander demonstrates the extra-ordinary consistency with which she pursues her own artistic strategy. In her “Patina Paintings”, for example, it becomes clear how images take shape in situ and how they portray their surroundings both in concrete and in metaphorical ways. Thereby, she surprises us with a subtle yet humorous exhibition that is especially designed for Haus am Waldsee. Karin Sander often works with the spatial and historical conditions of her exhibition venues. Her show at Haus am Waldsee that can be seen as a kind of “retrospective”, not only documents her numerous works since the early 1990s but also addresses its location, the building itself. After 73 years of continuous exhibition activity, it has been brought back to its original state of the years of construction, 1922/23, and now stands before us freshly renovated. Supported by The Berlin borough of Steglitz-Zehlendorf – office for further education and culture, department of culture; the Mayor of Berlin, Senate chancellery – cultural affairs; the association of friends and supporters of Haus am Waldsee. 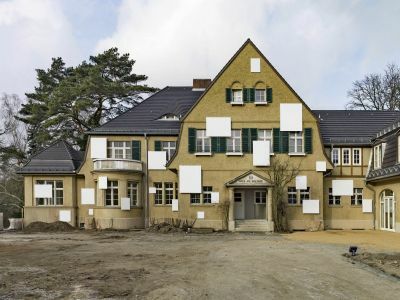 After 1.5 years of construction, Haus am Waldsee will be reopened with a large solo exhibition by Karin Sander. Built in 1922 by Max Werner as an entrepreneur’s mansion, the house now is renovated for the first time after almost seventy years of exhibition activity. In addition, a building wing destroyed in 1945 was replaced and enlarged by an annex on the east side. The whole construction was allowed by Deutsche Klassenlotterie as well as the district of Steglitz- Zehlendorf, and supervised by the architects Walter Grunwald and Georg Wasmuht. The new Haus am Waldsee will consist of more space for workshops, events, a library and for the café which is managed by a new tenant. A new entrance gate was built, using former plans and the entrance of the sculpture park was relocated to the left side of the building. For the reopening of Haus am Waldsee, we are pleased to present the exhibition A to Z with Karin Sander, which is customized for the exhibition space and will include the outside and inside area. The work of this award-winning artist, who has lived in Berlin and Zurich since 2000, and teaches architecture and art at ETH Zurich, is well-known and exhibited worldwide. Works by Karin Sander are present in numerous international collections and exhibitions. Throughout all phases of her work, she demonstrates an extraordinary consistency, with which she pursues her own artistic strategy. In her Patina Paintings , for example, it becomes clear how images take shape in situ and how they portray their surroundings both in concrete and in metaphorical ways. In this way, she will surprise us with a subtle yet humorous exhibition that is especially designed for Haus am Waldsee. show at Haus am Waldsee can be viewed as a kind of “retrospective”, that not only documents her numerous works since the early 1990s but also addresses its location, the building itself. In occasion of the exhibition, an artist book will be published by Verlag der Buchhandlung Walther König in German and English.